The EMU has posted the largest one-month drop in its trade surplus on data back to January 1999. The surplus fell from 23.1 billion euros in December to 15.7 billion euros in January. The factor behind this deficit drop is the rise in oil prices. The last great surge in the EMU trade surplus came in 2008 when oil prices were collapsing in the wake of recession and the financial crisis. Donald Trump has been talking a great deal about fair trade and about how he might pressure other nations to change the way they trade. He has been critical of countries that run large trade surpluses (Germany is a huge transgressor). It is not clear if this substantial move lower for the EMU surplus is going to change the way Donald Trump views Europe's trade practices. It really amounts to nothing since the shift is mostly about oil and oil prices. EMU trade is really dominated by trade in manufactures. For exports, the ratio of manufactured to nonmanufactured goods is near 5:1. For imports, the ratio is near 2.5:1. 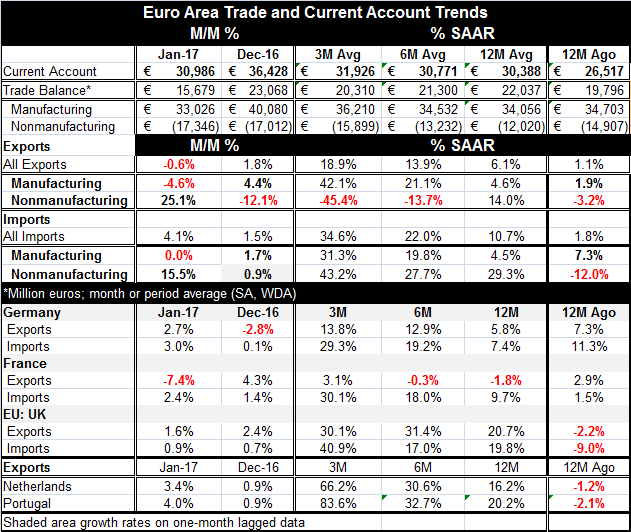 The balance on manufactures trade is 33 billion euros vs. a deficit in nonmanufactures of 17 billion euros. By and large what happens to EMU trade is a story about manufacturing unless something else shifts abruptly as it has recently as oil and other energy prices have jumped suddenly higher. The exports and imports of manufactures in Europe have been expanding at explosive rates of growth. Exports are up at a 42% annualized pace over three months, a 21% pace over six months, and by 4.6% year-on-year. Imports of manufactures are up at a 31% annualized pace over three months compared to a 20% pace over six months and a gain of 4.5% over 12 months. The pick-up in trade flows goes a long way to explain why European manufacturing PMI readings are doing better. The Baltic dry goods index, a widely-watched indicator of international trade traffic, is moving up sharply again, but the question for this index will be, "can its ebullience be maintained?" When it last surged in 2013 and 2014, it was not able to hold onto those gains and global trade in fact did not bounce back. However, now there are broader signs of trade activity picking up. There is now a G20 meeting getting ready to go in Europe. New U.S. President, Donald Trump, will have a chance to meet face to face with his European counterparts. His meeting with Angela Merkel is being closely watched. Europeans have had some tough rhetoric for Mr. Trump as his positions on U.S. trade and his comments on NATO were not well received in Europe. But Mr. Trump has since clarified some of those matters especially his position in support of NATO. Trump's way of making a point may be peculiar, but he wanted to be sure that Europeans knew that he was serious about wanting them to pay more for their own protection. His rhetoric while at first jarring settled down to a clearer less draconian position about individual nations monetary commitments to the pact. Time will tell just how much of an isolationist Trump is or whether he is a pragmatist who thinks the U.S. has been paying too much of other people's obligations. This, of course, depends substantially on what benefits the U.S. has gotten from underwriting the activities it has underwritten to the extent that it has underwritten them. I guess we are about to find out about that. And there are parallel concerns about the U.K. whose role everyone wonders about since it will soon cease to be part of the EU and it has had the best equipped military in the region. How tough does the EU really want to get with the U.K. after all as the U.S. is asking it to carry more of its own defense burden? European security concerns are, in the end, about more than just the U.S. role. But Donald Trump has played a role in jolting Europeans out of their comfort zone and that was not an accident. Europe, of course, is ever dependent on imported energy. And one important source is natural gas that is piped in from Russia that no one likes to talk about very much. Since relations with Russian have turned chilly (think Crimean Peninsula and Ukraine), Europe's ploy to go whole hog for detente and be reliant on Russia for energy has put it in an uncomfortable position from which to take a get-tough stand vs. Russia. Of course, Russian energy is a two-way street. Russians need the revenues and Europe needs the energy. Those two balancing needs probably keep both sides in the middle of the fairway regarding keeping the oil flowing. But no matter how much Europe complains that Mr. Trump has made the NATO alliance seem less unified or less solid, there no one who has undermined the security of Europe any more than the Europeans by becoming so dependent on Russian-sourced energy.